The Thrifty Groove: Goodbye Summer! I was planning a special “goodbye summer” tablescape but, it has been raining off and on all week so, instead, I put together a little tribute to summer through past tablescapes. 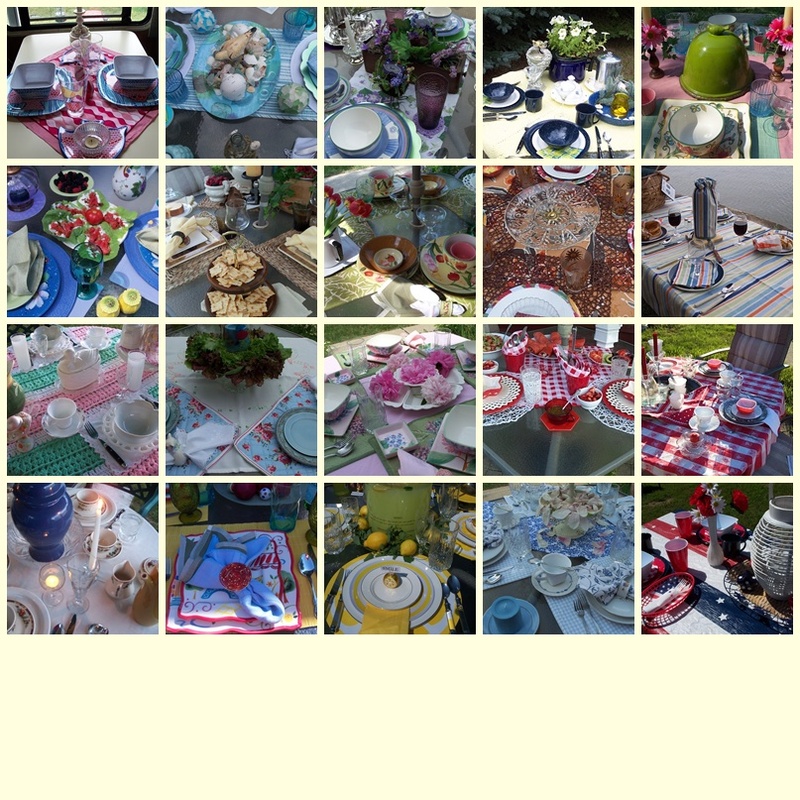 Each of the tablescape pictures below are clickable so you can visit any of these past tablescape posts. All of them are just lovely. Isn't it amazing how we can tell the story of our summer by the way our tables look. I've not done much in the way of trying to make mine look special lately but you've inspired me to do better from now on. Have a wonderful Wednesday! Lovely past tablescapes! Wish the weather would get cooler so I can get in the Fall mind frame...I'm more than ready for cooler weather! Thanks so much for featuring my Pina Colada Jam in TTF this week!!! I'm so excited!!! It was like watching the summer fly before my eyes again - and it was charming. I enjoyed your summertime tablescape tribute! Beautiful tables! They are all so beautiful! Feeling a bit sad the summer is over, but I sure do love fall! OMG! I love this look back at summer. It was hard to pick a favorite. I love the one with the purple glassed and the flip flop coasters are too neat. Thanks for sharing. Unique idea. What a great treat! Your tables are fabulous! This was a lot of fun, Diann! I loved seeing all of these in retrospect. Great idea to catalog and share them this way! I enjoyed them very much. I loved this! If summer has to end, at least we can enjoy and remember the beautiful settings you created. Very nice! These are all so beautiful! I love the details! If I had to pick... It would be the lemon table! All of your tablescapes are so pretty, and so different. What a lot of creativity you have! I especially like the one with the square placemats and square dishes. What a pretty tabletop tour! It's so fun to see these all posted together -- great idea! What a fun tabletop tour. You have so many gorgeous dishes. I love all your extra little details that help make the table settings so extra special. Hi, Diann! I'm glad you reposted summer tables past because I haven't seen them all. This was a wonderful way to get to see your creativity in a nutshell. Isn't it fun to kind of look back and see all the different things you've done? Kind of fun to reflect on the inspiration for each one, too! I especially like the one with the huge lemonade dispenser as centerpiece. Practical AND pretty! Ohhh...I'm sooo glad that you revisited a few of your fabulous summer tables today! I missed a few of them so this was such a treat! You know, I began by trying to choose my favorite but soon lost track! Hehe! I will say though, that I really enjoyed the pretty yellow, green, and red tulip table! And...I also really loved the pink and green peony table! Then...there is that gorgeous sunny yellow and bright white...lemonade table in your last photo that just took my breath away! What a beautiful "ode to summer", dear friend! Thank you sooo very much for always sharing your creativity and many talents with us...you always inspire me!!! This cool... reviewing the year's TS. I love every single piece you have in every settings. What a collection of pretty tables Diann. It is funny how many tables I do too. So much easier than redecorating and cheaper. Lovely tables. Thank you for linking it up to Home Sweet Home!